A short, comfortable flight from Punta Arenas, Chile, to King George Island in Antarctica has you with boots on the ground, overtaken by the sheer magnitude of the Seventh Continent. Fully immersed in the Antarctic environment, you’ll experience a roller coaster of emotions, from excitement to awe, from exquisite solitude to incredible gratitude for the wonder of it all. You may go in search of whales and find yourself bearing witness to a glacier calving. Or, you might plan to climb one more peak for a better vantage point and find yourself in a rookery of curious penguins. Antarctica will leave you in awe, but it won’t leave you unchanged. Your adventure begins in Punta Arenas, Chile, the most populated city in Patagonia. If you arrive early, there are many museums, restaurants and shops to keep you busy for days. By early afternoon, a polar expeditions representative will meet everyone at the official starting point hotel, where you’ll enjoy a welcome dinner and be briefed about preparing for your embarkation day. Your charter flight from Punta Arenas to Antarctica will have you crossing the legendary Drake Passage in only a few hours. Far below, the ship is approaching King George Island for your arrival. Your first glimpse of dramatic Antarctica landscapes will be from a very unique perspective, as your plane descends for landing in the South Shetlands. After landing, stretch your legs and spend some time exploring the island before being transferred by Zodiac to your ship. Meet the rest of your shipmates and set sail for the Antarctic Peninsula! Crossing the Antarctic Circle is an impressive achievement, as most expeditions to the Peninsula do not reach 66° 33’ S. You and your shipmates will celebrate in style with a well-earned glass of champagne! With a toast to the first explorers who ventured this far south, you can take pride in knowing you’ve made it to a part of the world still visited by very few people. This is raw Antarctica, home to the midnight sun, Weddell seals and some of the most magical, odd ice formations you’ll see anywhere in Antarctica. If you haven’t had your fill of Antarctic wildlife and icebergs by now, you’ll surely be satisfied by the time we return to the Drake Passage. We’ll continue to journey onto land and out by Zodiac twice daily as we travel north along the western Antarctic Peninsula. Your Expedition Team will always be on the lookout for any species of penguins, seals and whales that may have eluded you on the journey south. After your week of exploration, you’ll say goodbye to the Expedition Team and disembark at King George Island. Your three-hour flight across the Drake Passage to Punta Arenas, Chile brings your adventure to an end. After we transfer you from the airport to the hotel, you can enjoy a final dinner in the city to reminisce about all the sights and sounds of Antarctica. The 118-passenger Sea Adventurer, (formerly the Clipper Adventurer) is among the very few vessels in the world specifically constructed for expedition voyages to the remote polar regions. Her ice-strengthened hull permits her to glide easily and safely through ice-strewn waters that are not accessible to conventional cruise vessels. She has advanced communications and navigation equipment, and newly installed, state-of-the-art Sperry Gyrofin stabilizers. In 1998 the Adventurer had a $13 million conversion done in Scandinavia. She is a handsome expedition vessel, done in the style of great ocean liners when ships were ships. With lots of varnished wood, brass, and wooden decks, the ship has all new outside cabins, with lower beds and private facilities. There is a Main Lounge, bar, Clipper Club, library/card room, gymnasium and gift shop. A multi-national staff serves American and Continental cuisine. The ship has a fleet of 10 Zodiacs and a special loading platform. An ice class rating of A-1 allows the Clipper Adventurer to go to places larger cruise ships can only dream of, and she does it in comfort and style unsurpassed by other vessels her size. Cabins: All cabins have a window with outside view. Each has private facilities. 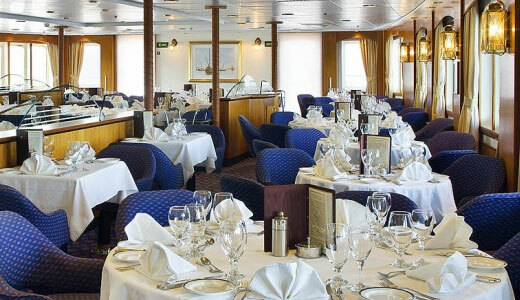 61 outside cabins with exterior views and private facilities. Ship-to-shore satellite communications with email, and wireless, Internet access. Deck Plan for some trips may vary, please ask for details. For centuries, intrepid explorers were determined to find the Northwest Passage, the fabled and often fatal route of icy channels connecting Europe with Asia. None of their stories is as ......click here to read more. Venture far above the Arctic Circle, in a land where the sun never sets and polar bears roam, with the Best of the Western Arctic: Canada and Greenland itinerary. You’ll ......click here to read more. You’re ready to explore King George Island and the Antarctic Peninsula – and no Drake Passage crossings required! Included charter flights between Punta Arenas and Antarctica have you experiencing the ......click here to read more.